Sweet, succulent blackberries are summer delicacies in the northern temperate regions. As in raspberries, they too grow on shrubs known as "brambles." The plant is native to sub-arctic Europe and nowadays grown at commercial scale in North America, particularly in the USA, to as far as Siberia. Allergy to blackberries is uncommon and rare. There are only a few reported cases, particularly in some sensitized individuals. The reaction may be thought to be due to the presence of salicylic acid in the berries which, may cause symptoms like swelling and redness of mouth, lips, and tongue, eczema, hives, skin rash, headache, runny nose, itchy eyes, wheezing, gastrointestinal disturbances, depression, hyperactivity, and insomnia. Individuals who suspect an allergy to these fruits may want to avoid them. (Medical disclaimer). <<-Back to Fruits from Blackberries nutrition. Visit here for an impressive list of all variety of fruits with complete illustrations of their nutrition facts and health benefits. 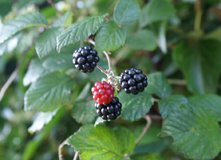 Growing blackberries-Department of fruit science, Missouri state university(pdf-Link opens in new window).